The black hole of this card's artwork also appears in the artwork of Non-Spellcasting Area. 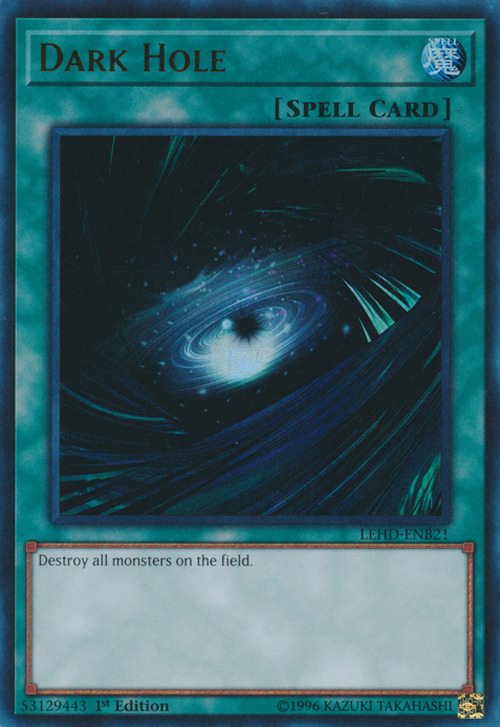 In all languages apart from English and Spanish, this card's names translate to Black Hole and reference an invisible mass in astronomy that swallows anything that comes too close, both in its translated name, its artwork and its effect. White Hole was specifically designed to counter this card. This card was Forbidden for nine formats before becoming Limited once more, which was the most of any card before Black Luster Soldier - Envoy of the Beginning, Tsukuyomi, Magician of Faith (in the TCG) and Cyber-Stein (in the OCG) surpassed it with twelve, thirteen, and sixteen, respectively. Morphtronic Forcefield: You can chain “Morphtronic Forcefield” to effects that do not target, like “Dark Hole”. "Grandmaster of the Six Samurai: If "Grandmaster of the Six Samurai" is destroyed simultaneously with other "Six Samurai" monsters by an effect like "Dark Hole", the effect of "Grandmaster of the Six Samurai" activates and adds 1 "Six Samurai" monster that is currently in the Graveyard to the hand. This does include the "Grandmaster of the Six Samurai" and the other "Six Samurai" monsters that were destroyed by "Dark Hole". : DARK HOLE vs. GRANDMASTER - KIZAN -YAICHI!!!! You cannot activate a card if it would do nothing. For example, you cannot activate "Dark Hole" if there are no monsters on the field. : Can you activate a Spell/Trap Card if you cannot apply its effect? : When there is no valid target, is it possible to activate "Hammer Shot"? If multiple cards are sent to the Graveyard simultaneously, then the player can choose the order in which those cards are placed in the Graveyard. If "Dark Hole"/"Painful Choice"/etc send multiple cards to the Graveyard, then after you sent the cards to the Graveyard, "Dark Hole" is sent to the Graveyard last. : When multiple cards are sent to the Graveyard simultaneously, can you choose the order in which they are placed in the Graveyard? Acid Trap Hole: A Flip Effect Monster flipped by "Acid Trap Hole" has its Flip Effect activate after the current Chain resolves. If "Acid Trap Hole" is Chained to "Dark Hole" and flips "Cyber Jar", then the effect of "Cyber Jar" activates after "Dark Hole" resolves. : If "Acid Trap Hole" is Chained to "Dark Hole" and targets and flips "Cyber Jar", how does it resolve? Banisher of the Light: If "Banisher of the Light"/"Banisher of the Radiance"/etc and other monsters are destroyed simultaneously by "Dark Hole", then all destroyed monsters and "Dark Hole" are sent to the Graveyard. : Is a monster destroyed by "Dark Hole" removed from play by "Banisher of the Light"? Crystal Beast: If a face-down "Crystal Beast Ruby Carbuncle" etc is destroyed by "Dark Hole"/"Torrential Tribute"/etc, then it cannot be placed in your Spell & Trap Card Zone as a Continuous Spell Card. : When a face-down "Crystal Beast Ruby Carbuncle" is destroyed, can it be placed in your Spell & Trap Card Zone as a Continuous Spell Card? Exodia the Forbidden One: Suppose that two copies of "Sangan" are destroyed simultaneously by "Dark Hole" while both players have four pieces of "Exodia the Forbidden One" in their hands. Both cards' effects activate and form a Chain, with the opponent's "Sangan" as Chain Link 2. Resolving backwards, the opponent adds a piece of "Exodia the Forbidden One" to his hand, causing him to win the Duel. : Who wins the Duel if both players use the effect of "Sangan" to complete "Exodia the Forbidden One"? Sangan: If each player has a "Sangan" sent to the Graveyard simultaneously by "Dark Hole" etc, the two form a Chain and you resolve backwards. The Turn Player's "Sangan" is Chain Link 1, and the opponent's is Chain Link 2. If each player has four pieces of "Exodia" in his hand, then Chain Link 2 resolves first and the opponent is declared the winner before Chain Link 1 resolves. : If both players' "Sangan"s activate simultaneously and both complete "Exodia the Forbidden One", who is the winner? If "Dark Hole" or "Raigeki" is activated and a monster is face-down, the monster is affected. All monsters are destroyed, regardless of Battle Position. : SPECIFIC CARDS RULINGS""
Big Shield Gardna: A face-down "Big Shield Gardna" can only negate a Spell Card that targets 1 face-down monster, so it cannot negate"Dark Hole"
Coffin Seller: If multiple monsters are sent to the Graveyard at the same time (due to "Dark Hole", etc.) then inflict 300 damage only because it is considered as 1 time. Dramatic Rescue: You can activate "Dramatic Rescue" when an Amazoness on your side of the field is targeted but not when cards like…"Dark Hole" are used. Fire Princess: If you have a face-up "Fire Princess" and a Set "Poison of the Old Man" when your opponent activates "Dark Hole" you may chain "Poison of the Old Man" to increase your Life Points and the effect of "Fire Princess" will deal 500 damage to your opponent even though she is then destroyed by "Dark Hole", because the effect of "Fire Princess" is a Continuous Effect. Freed the Matchless General: The effect of this card will not negate"Dark Hole"or similar Spell Cards that do not target. 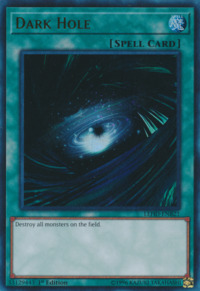 Heart of Clear Water: A monster equipped with this card can still be destroyed by effects that do not target, such as the effects of"Dark Hole"
Lord of D.: "Lord of D." will NOT stop "Dark Hole"nor will he protect your Dragon-Type monsters from their effects, since these cards affect the whole field and do not select targets. Maiden of the Aqua: If you have "Maiden of the Aqua" (with her effect active) and "The Legendary Fisherman" or "Deepsea Warrior" on your side of the field, and "Dark Hole" is activated, "The Legendary Fisherman" and "Deepsea Warrior" will not be destroyed. My Body as a Shield: "My Body as a Shield" will negate cards such as "Dark Hole"
Riryoku Field: This card cannot be used against"Dark Hole" because these cards do not target. Ryu Senshi: The effect of this card will not negate"Dark Hole"or similar cards that do not target. Skull Invitation: If "Dark Hole" destroys monsters controlled by both players, the damage from "Skull Invitation" is applied to both players simultaneously.